Hello and welcome to Årsunda Viking! The Viking village will be open in July and August, week 27-28 and week 29-31. Wednesdays-Sundays 3-7 July and 10-14 July at 11.00-16.00. During these two festival-like weeks the village will be crowded with vikings who will show you around the houses and tell you about their everyday life at the farm. Each day you can buy food, listen to stories about gods and giants, try various handicraft, learn how to make a fire the viking way, say hello to the animals living at the farm and watch (and try) viking games. 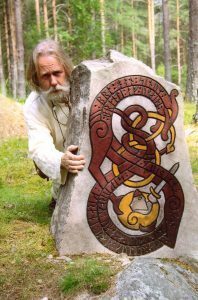 During these three weeks there are two vikings at the village ready to show you around the surroundings and tell you more about the houses, the runestones, how to make iron and other things. You can also try on chainmail armoury and some handicraft. We are also open for reservations in Spring, Summer and Autumn. We do tours, programmes for schools, birthday and wedding parties, conferences and other events. Please email us at info(a)arsundaviking.se if you have questions or want to make a reservation! Read more about the Viking village. Read more about the feasts we offer. Read more about the tours we offer. Check out our gallery for pictures of our village and activities!